Though the Village of Waumandee, population 46, is just a speck on the map, this year’s celebration of the sesquicentennial of St. Boniface Parish is a testament to the importance of faith, family values and the practice of the golden rule in this rural farming community. 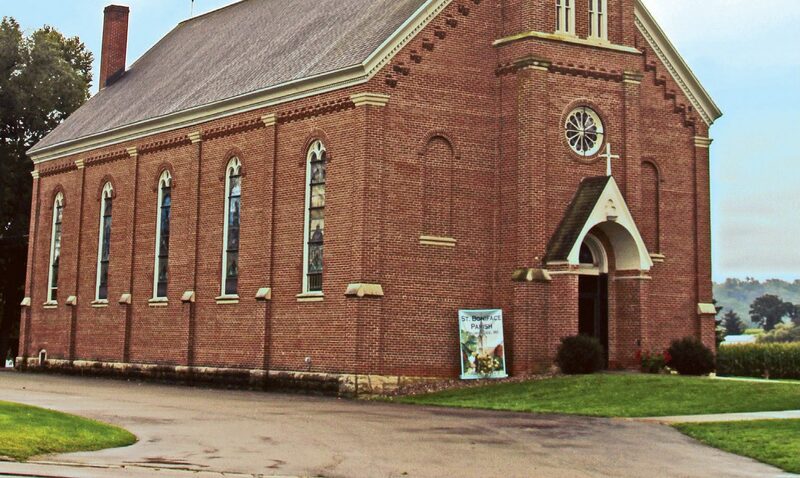 Since 1867, and even many years before, the people on the small family farms have blessed this area of western Wisconsin with their Catholic faith. Now, 150 years later, many of the small family farms are large farms, but not much else has changed. Locals continue to provide directions such as, “Go past Montana Ridge,” or “Head to Irish Valley,” or “My farm is up the valley”. People who live here know exactly where you are. Many landmarks are names given by the first settlers of the area. What makes a parish? Definitely a church; maybe a school, rectory, parish hall or a cemetery. Possibly even a convent in days gone by. St. Boniface Parish has all of these. But the most important part of a parish is its people — parishioners who take pride not only in their parish, but in their family. St. Boniface Parish has many of these! Started as a mission church of Fountain City in the 1850s, St. Boniface was established in 1867 by German and Irish settlers. Since the German population outweighed the Irish, the patron saint of Germany, St. Boniface, was chosen for the parish name, instead of St. Patrick. Statues of both saints adorn the altar of the church. Seeing a need for Catholic education, parishioners built a school in the 1890s. Deemed unsafe in 1928, due to being constructed with 72 windows, the school building was demolished. The priest believed the moral fabric of the community was failing after the school closed, so, two years later, a new school was constructed. At one time, all of the parish children attended the school. This four-room schoolhouse was home to 150 students for many years. A letter was found in the 1960s written by the nuns and sent to the parents, asking them to remove some children from the school because there were too many. The school was crowded and the children were getting into trouble. Only two students transferred out. This was a testament to the strong faith of the community. The school continues to teach grades K-8 today. Though in a small village, the parish is home to more than 190 families. These families make up not only the heart of the parish, but also the community. 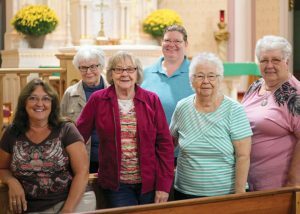 St. Boniface Parish has many long-time parishioners who make this parish a home. From left: Karen Pronschinske, Rose Hillig, Charlotte Bremer, Teresa Waters, Rita Bork and Elsie Bromme. Rita Bork has been a parishioner for 85 years. She was born and raised in Waumandee, attended the parish school, received all her sacraments here and now lives across the street from the church. Her father was born “up the valley” in a family of 10 children. She has 72 first cousins, with all except one being Catholic. She fondly recalls her wedding day at the church. Marrying at 8 a.m. was normal back then, due to the midnight fast. “We didn’t have anything to start out. You worked hard.” She recalls when she and her husband, Cyriac, were dating. 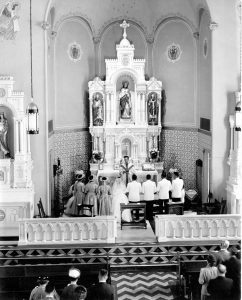 One Sunday they decided to attend St. Peter and Paul Church, a small country church by Montana Ridge, which celebrated Mass once a month. She sat in the pew with him and everyone kept looking and staring at them. Only after Mass did she realize the men sat on one side of the church and the women on the other. “I didn’t know anything about this. When I returned home, my mother said she should have told me that.”Bork and her husband had eight children and attended many marriage encounters across the nation. “This is something my husband liked. He was anxious to go. It was so interesting. Some people misinterpret marriage encounter. They think you have a bad marriage,” she explains. They traveled to the encounters only after the children grew up, since they were unable to afford to travel while raising a family. They also belonged to a square dance club for 25 years. “We have a wonderful community. I always brag about it. If you need help or anything, somebody’s going to help. I have true love for the church for as long as I live,” she says. The most challenging part of life for her now is recovering from health issues. “I sit in this house across the street from the church and I can’t get to Mass. This bothers me the worst,” she says. Dan and Elsie Brommer have been members of the parish for half of its 150 years. Born and raised here, they met in first grade in the parish school. Dan’s family lived across the road from the Montana Ridge church. Elsie was raised “down around the corner in Irish Valley. On Sundays, they would pray the rosary on the way to Mass. Because Mass was in Latin, and the readings and homily in German, they stayed outside and finished praying the rosary before entering the church. Rose Hillig is a “newcomer” to the parish. One weekend she traveled across the river to a classmate’s home and met the classmate’s brother — her future husband. They were married in 1951 and she’s been a member of the parish since. Teresa Waters is the “youngster” of the group. Her great-great-grandfather was one of the founding members. Her dad’s family grew up here and he attended the parish school. She says, “Somehow, coming back visiting Grandma made this my home, too. If you have relatives here, this is your home.” So, Teresa came home 12 years ago. Karen Pronschinske has been a parishioner all her life. “After I graduated, I thought I could do what I wanted,” she says. But with her strong Catholic upbringing, her conscience got the best of her. “Oh, my goodness, you don’t miss Mass!” A very active member in the parish, her upbringing led her to be a Catholic school teacher in Independence. Wedding of Al and Darlene Slaby, married Oct 20, 1956, at St. Boniface Church. 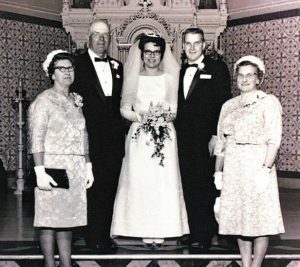 Wedding photo of Dan and Elsie Brommer, married May 7, 1966, at St. Boniface Church. mother. Dan’s father died in 1962. What brings these and many other parishioners together is their strong faith. This is what makes up St. Boniface Parish. It’s great to celebrate 150 years as a parish. It’s even better to have such a close-knit community where everyone knows your name and family values carry on to descendants. This is a place where celebrations are measured in generations and memories, not in years.